Owing to their dispersion among populations professing creed different from their own, Jews have married ear relatives more frequently than the rest of the world. The marriage of first cousins and even of uncle and niece is quite legal and usual among them (see Marriage). The limitations on the marriage of those of priestly descent would tend to limit the choice of Cohens to those nearly related to them.The tendency seems to have begun early, since Abraham is represented as having sought a wife for Isaac in his mother's family. In the Middle Ages it is difficult to ascertain how far the Jews tended to marry within their own families; but the Ghirondi family, to which Naḥmanides, Gersonides (who married his first cousin), and Simon Duran belonged, appeared to have married relatives for several generations (Steinschneider, "Cat. Bodl." cols. 2305-2310). 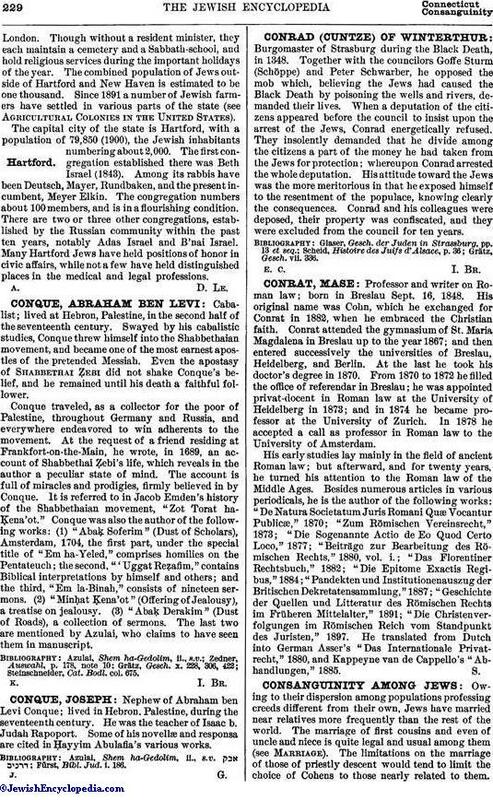 An attempt has been made to ascertain the proportion of first-cousin marriages among English Jews upon the method invented by G. H. Darwin ("Fortnightly Review," July, 1875), based on the number of marriages in which both bride and bride-groom have the same surname. This method gives a proportion of about one-fifth. Judging by this criterion, the percentage of cousin-marriages in the English peerage was 4.50 among the landed gentry, 3.75 in rural districts, 2.25 in London. Applying the same method to English Jews, Jacobs calculated that 7.52 per cent of their marriages were first-cousin marriages. By another method W. Stieda found that there were 23.02 per cent per thousand consanguineous marriages among the Jews of Alsace-Lorraine as compared with 8.97 among Catholics and 1.86 among Protestants ("Die Eheschliessungen in Elsass-Lorhringen," 1872-76, Dorpat, 1878). It would therefore appear that the proportion of first-cousin marriages among Jews is about three times greater than among the non-Jewish population. It seems that consanguineous unions are more fertile and less sterile than other marriages. 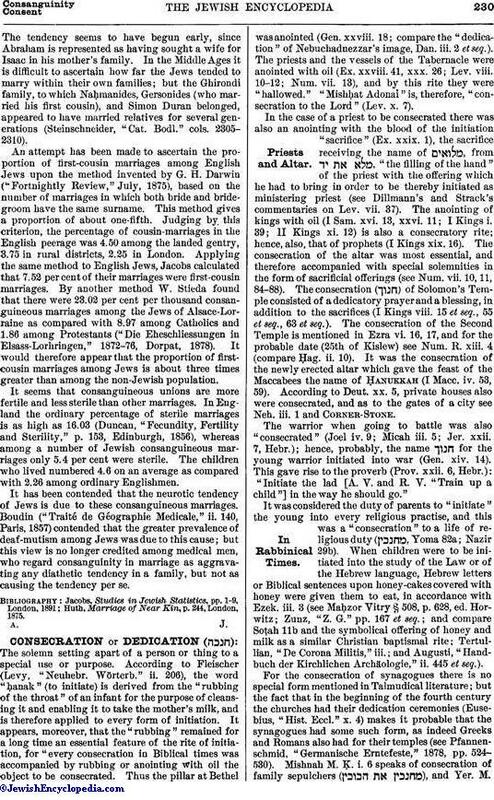 In England the ordinary percentage of sterile marriages is as high as 16.03 (Duncan, "Fecundity, Fertility and Sterility," p. 153, Edinburgh, 1856), whereas among a number of Jewish consanguineous marriages only 5.4 per cent were sterile. The children who lived numbered 4.6 on an average as compared with 2.26 among ordinary Englishmen. It has been contended that the neurotic tendency of Jews is due to these consanguineous marriages. Boudin ("Traité de Géographie Medicale," ii. 140, Paris, 1857) contended that the greater prevalence of deaf-mutism among Jews was due to this cause; but this view is no longer credited among medical men, who regard consanguinity in marriage as aggravating any diathetic tendency in a family, but not as causing the tendency per se. Huth, Marriage of Near Kin, p. 244, London, 1875.